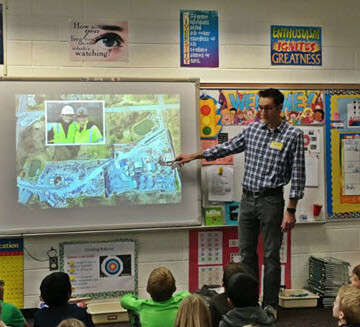 ASCE member James Wonneberg speaks with a fourth-grade class at Liberty Elementary School in Chantilly, VA.
Word spread around the classroom in a flash – the guest of honor had arrived. The students piled around the doorway, trying to see. Who was visiting Leanne Fisher’s fourth-grade classroom at Liberty Elementary School in Chantilly, Loudoun County, VA? An athlete? A rock star? Nope. To the kids, even better. The guest of honor was James Wonneberg, civil engineer. 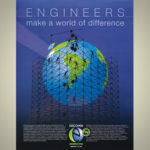 Fisher’s fourth-graders have been learning about engineering as part of a Loudoun schools initiative, One to the World, which aims to develop 21st century-relevant skills in students through project-based learning. In October, Fisher screened an ASCE video, “What Do Engineers Do?” which featured Wonneberg and his work on construction of a massive tunnel to help reduce sewer overflows into Washington, DC, rivers. Her students were so excited by what they’d seen that she decided to reach out to Wonneberg via Twitter. Wonneberg, P.E., A.M.ASCE, brought with him a PowerPoint presentation tailored for the fourth-graders, and a genuine curiosity about what they were learning. He got down on the carpet and had face-to-face conversations with the students about their projects. Wonneberg’s gift for instruction can be attributed in some part to conversations he has at home with his two children, 5 and nearly 3. Students at Liberty have been learning about landforms and pollutants and the roles civil engineers play in helping society. 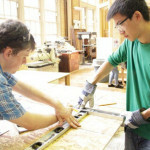 Pack said the school has emphasized STEM subjects – science, technology, engineering, and math – for several years. 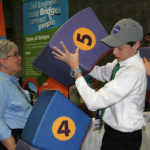 This year, the school district is encouraging all students and classrooms to connect with the real world as part of the One to the World instructional plan. Fisher’s class recently presented its project, including the story of Wonneberg’s visit, to the school board. Growing up in St. Charles, IL, Wonneberg discovered his love for engineering not in fourth grade but still relatively early – in high school. “I started a class called Product Design, and that was the first time where I was like, ‘Whoa, designing stuff is actually really fun!’” he said. Wonneberg is now the resident engineer responsible for construction management of the Blue Plains Tunnel, part of DC Water’s Clean Rivers megaproject. And he’s now the resident hero in Fisher’s classroom. “They feel like James is a buddy; he’s their friend, a mentor,” Pack said. “And that was just from one visit.” Students sent him a certificate of gratitude, thank you notes, and one of their water-cycle activities for his kids to enjoy. Wonneberg and the class have remained in contact through Twitter. “We’re definitely going to keep in touch,” Fisher said. Wonneberg shares his enthusiasm for his visit to the school in his own words. 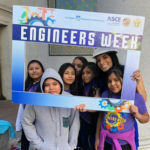 Engineers, teachers, parents, and students can learn more about ASCE educational opportunities connecting civil engineers with young learners.